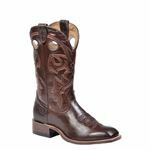 Square Toe Cowboy Boots are the rage again for men, youth and all. and where to get the best deals on them. See pictures of the latest lineup of this western boot for year round pleasure. There is little exact history as to its origins. The early cowboy boots were based on old civil war and the Wellington boot but according to the boot maker they varied in toe design. You will find the squared toe and the round toe in the old civil war boots. Square toe cowboy boots were worn according to taste and availability. In any case, they caught on due to the look and their comfort. From our experience, we remember the early models we wore as kids and youngsters were a square toe of different widths. Even the narrower toes in those days seemed to have a squared off toe. You would see Gene Autry, Hopalong Cassidy and Roy Rogers wearing their squared-off toes and everybody wanted the same. That was the fashion when I was young. Slowly, as happens with all items of fashion - it seems like a generation or two -, the square toe was left in the past to make room for the rounder toes. 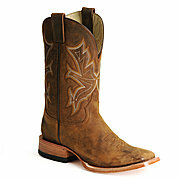 The roper boot was originally made for the purposes of the rodeo and roping, had some influence on this. Later on, western films had some decades-long impact on the shape of the toe. Round narrow toes pushed out the rectangle shape. Silverado and the Urban Cowboy were extremely influential in the design of the western foot gear in those years. Now, thankfully for us that like the square toe, there has been a resurgence of the this great looking tip. The shape has been modified to reflect modern tastes. The winds of change are blowing!! The new form is a bit lower as it reaches the sole. This gives it a more fashionable look of the times. 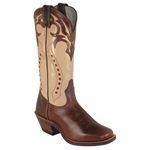 Of course there are many that continue to insist on many variations of this type of toe and for this we have our wonderful custom boot makers. To make your browsing and shopping experience more pleasurable, we have included clickable pictures below so you have direct access to top sellers from the comfort of your home. Just click on any picture on Below to check it and others out.